Last summer I toured Europe on a BMW R1200GS, and so did everyone else. Or at least it seemed that way. Every café car park, scenic view, lay-by and service area had about 20 GSs in it. The GS is a mighty good bike and not just because Ewan and Charley rode them all over the telly, but I felt a bit like a sheep. There's another snag with the GS and that's its weight and height off the ground. I'm only 5ft 10 and a bit of a wimp, so there's always the worry that a foot might be plonked accidentally into a pothole and the whole bike (which with me, luggage and full of fuel must weigh almost 300kg) will topple over. I've dropped GSs off road and they take a bit of picking up. 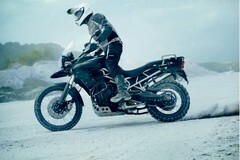 BMW's smaller F800GS is much more manageable and is the bike I'd choose for a trip to Morocco or anywhere else windswept and interesting. 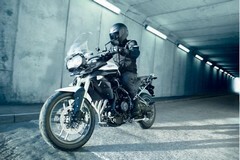 But now I'm not so sure, because I've just ridden Triumph's new Tiger 800 and it's a bit good. 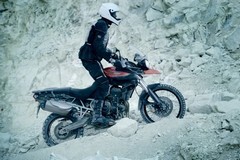 Triumph has been a player in the adventure bike market almost since it started building bikes in Leicestershire in 1990 but the new Tiger 800 is the company's first serious attempt at a bike that can actually go off road. 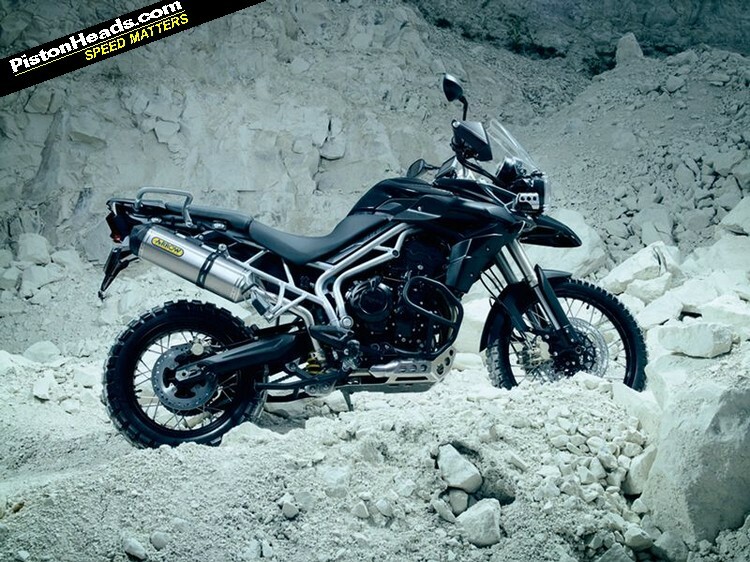 Two Tiger 800s are available: the (£7,149) 800, which is intended to spend its life on Tarmac, and the (£7,749) 800XC, which is the off-road version. Both are powered by a trademark three-cylinder engine, but it's not simply a larger version of the existing small three that's used in the Daytona sports bike and the Street Triple. The crankcases are the same but from the crankshaft up it's a bespoke motor with a longer stroke for more torque. You can spot the difference between the normal Tiger and the XC from 100 metres because the XC has wire wheels instead of the normal bike's alloys. The XC also has a 21in front wheel to the road version's 19-incher. Sit on the XC and you'll immediately notice a few other differences like higher and wider handlebars and a higher seat height. The wider 'bars are to increase leverage and reduce steering effort off-road and can be adjusted by removing the alloy mounts and turning them around to move the 'bars backwards or forwards. Suitable for goats, not sheep? The XC has 40mm extra suspension travel at the front and 45mm at the back and its rear shock has a remote reservoir and is adjustable for preload (the 800 has a more basic unit without the reservoir). The seat height is 35mm taller on the XC at 865mm but you can remove the seat, flip a bar up the other way and lose 20mm in seconds. If you still can't get both feet on the ground then you can buy the optional short arse seat that drops the height down to 825mm. That's the dynamic differences between 800 and 800XC; the other changes are more aesthetic. The XC gets a double front mudguard (like the GS's 'beak'), handlebar lever protectors and adjustable headlamps. 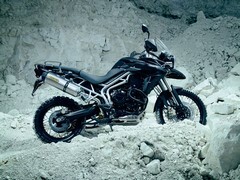 Triumph says that it expects that sales of the Tiger will be split 45/50 between 800 and 800XC respectively, but since even those who go for the more off-road focused version will be unlikely to get their boots dirty for more than a few miles a year we'll have a go on the roadie Tiger first. It's cold and damp, just the sort of weather in which it's easy to highside or lowside a superbike on tyres that haven't got any heat into them. First thing you'll want to do when you've written the cheque for the Tiger 800 is write another one for a decent pipe. Like all the Triumph threes, the Tiger's engine sounds great and has stacks of character. The fuelling on the engine is spot-on and there's only a slight lurch as you shut the throttle fully. Within a mile or so you'll have built-up loads of confidence in this bike. 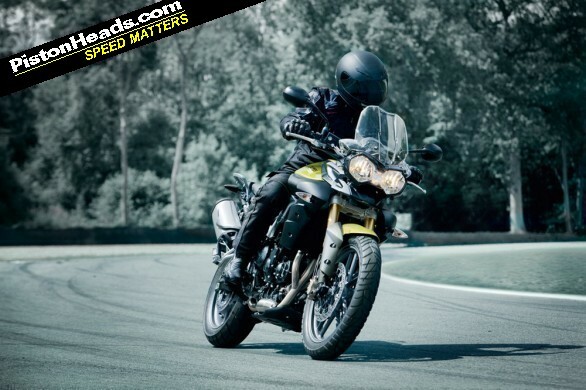 The engine feels more torquey than the 675 motor and the Tiger has longer gearing than the Street Triple, so the power delivery feels softer and less manic. The triple will still zap to almost 10,000rpm but it doesn't have the top-end rush of the smaller engine. 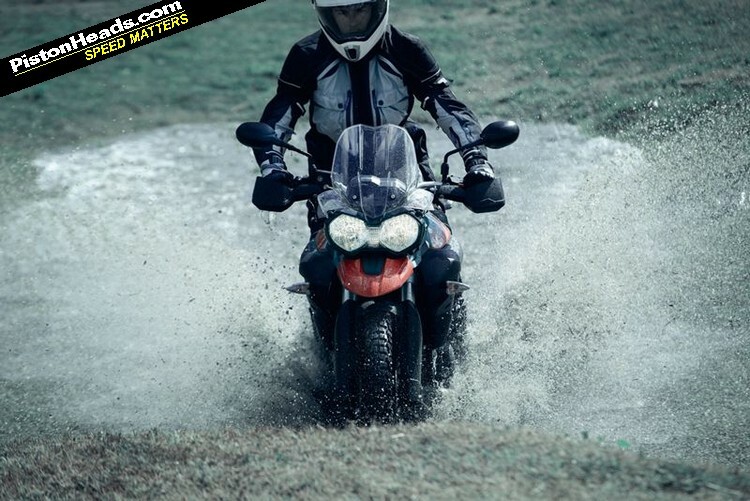 Since an adventure bike is essentially a touring bike under another name you'll probably want to go for the optional £600 abs (it's switchable for when you go off-road). The 800 is fitted with Pirelli Scorpions that feel perfect for the bike. Because the engine has so much character it's hard to resist riding the Tiger like a nutter - like a Street Triple in other words - and because the front end is so neutral and predictable. 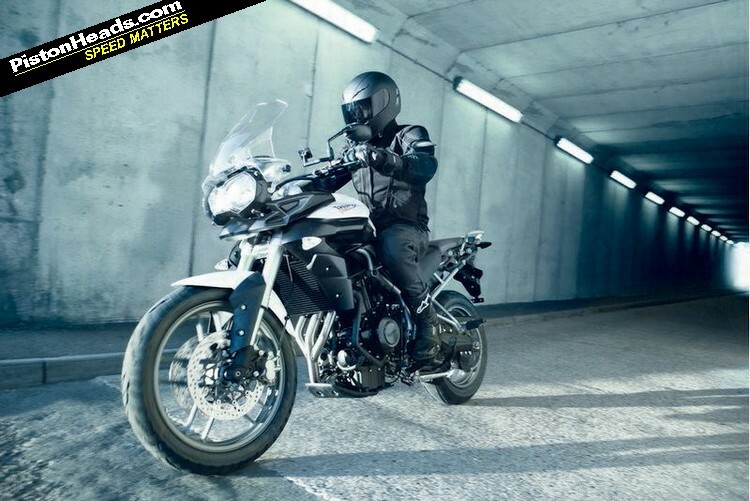 The Tiger 800 feels more like a street fighter-style bike that's been tweaked for longer distance riding than it does an adventure bike that's been given a shot of adrenaline. ...we'll get nice colour pics next time! Which is why the 800XC feels a little bit disappointing after the 800. It still feels surefooted despite its higher centre of gravity, larger front wheel and more off-road biased Bridgestone Battlewings (pukka Metzeler Karoo off-road tyres are an option), but there's a vagueness from the lighter steering that takes away some of the fun. 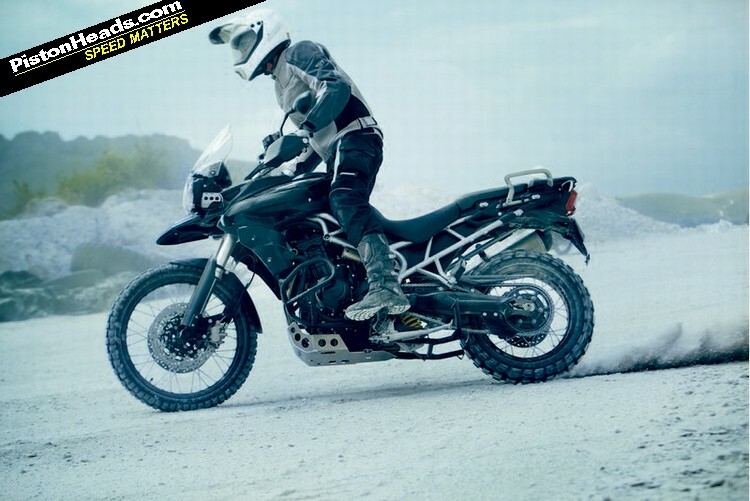 Unless you really are going to the Sahara or doing proper trail riding, I'd stick to the straight Tiger 800. You can spec-up this bike with XC kit like the lever guards, fog lamp and mudguard anyway, so you can get the hairy-chested look without losing the standard bike's sharper steering and more fun character. 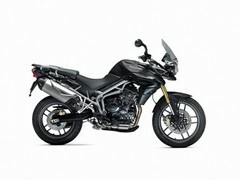 Triumph is big into accessories and there are plenty of things to spend your money on for the Tiger. The bike is fitted with a powerful alternator so you can plug in heated kit for the winter. I averaged about mid 40s to the gallon on the trip computer, but with more sensible riding you could do an easy 200 miles to a tank. 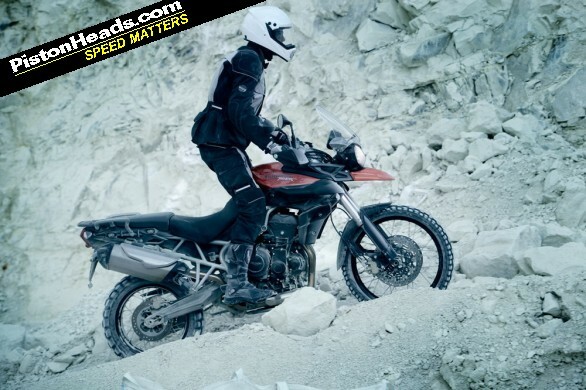 Nothing like as impressive as the BMW F800GS, which can manage 70mpg, but then the Triumph is a very different sort of bike. 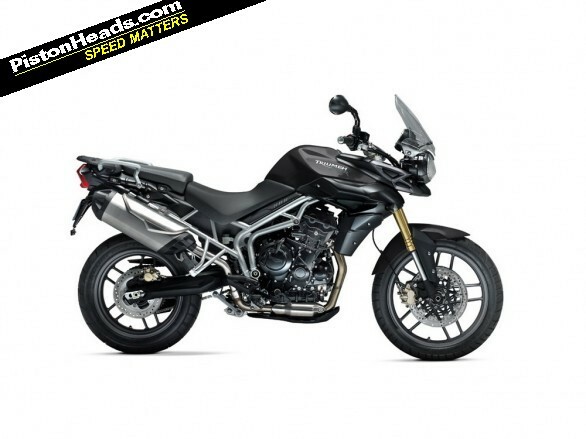 The BMW is a brilliant lightweight adventure bike but it doesn't have the character and fun of the new Triumph. 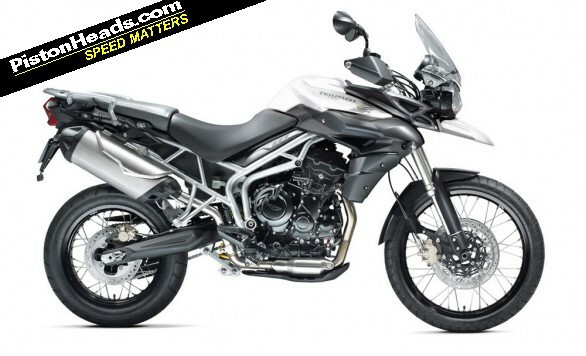 have Triumph lost 5% of their allocation of 800 Tigers already then? Anybody else want to start a PH2 Tiger 800 thread then ?? I'm confused, which thread is this? But seriously, it's a cracking looking bike and I'll definitely be taking a test ride when I get home again.